Comic-Con International has announced that the Eisner Awards judges have selected three individuals to automatically be inducted into the Will Eisner Comic Awards Hall of Fame for 2014. 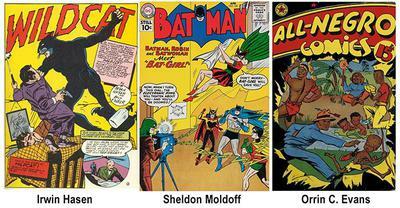 These inductees are Golden Age artists Irwin Hasen, Sheldon Moldoff and Orrin C. Evans. The judges have also chosen 14 nominees from which voters will select 4 to be inducted in the Hall of Fame this summer. These nominees are Gus Arriola, Howard Cruse, Philippe Druillet, Rube Goldberg, Fred Kida, Hayao Miyazaki, Tarpé Mills, Alan Moore, Francoise Mouly, Dennis O'Neil, Antonio Prohias, Rumiko Takahashi, George Tuska, and Bernie Wrightson. You Missed the Feb 7th Deadline! 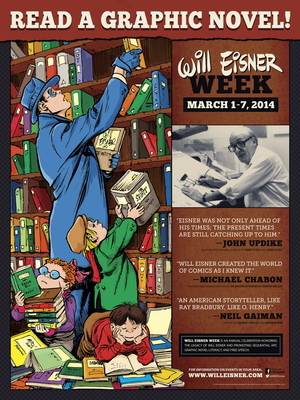 The Will Eisner Graphic Novel Grants for Libraries have found a permanent home with the American Library Association. The 2014 grants will be presented in June at the ALA Annual Conference.